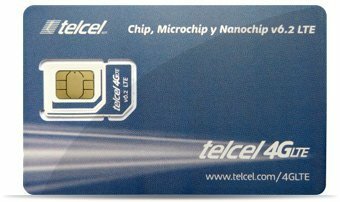 This prepaid Telcel LTE 3 in 1 SIM Card is brand new, registered and activated. Once you receive the SIM, you will need to enter your arrival date in our activation portal. Telcel is the largest operator in Mexico and has the most extensive coverage with the fastest speeds. You can refill the SIM with additional Minutes and Data packages either through our website or directly with Telcel (instructions provided with the welcome package). Ideal buy for your unlocked iPhone, Android device or any other unlocked GSM phone. It comes with a Mexican phone number from Mexico City (+55) and is activated with the cheapest calling rates for calls to USA and Canada. Incoming calls are always free. The SIM can be re-used as long as there is a refill every 6 months after activation or less. Our Telcel SIMs are tested before being shipped so there is no defect rate and we provide 24/7 customer support as well even though our solution is Plug and Play. If you have any questions about this product by Telcel, contact us by completing and submitting the form below. If you are looking for a specif part number, please include it with your message.